I first touched the 240s in week 16 (April) with a weight of 248. May was my first month with an monthly average weight in the 240s. I only have two weigh-ins this month and they average 248.5 lbs. However, today’s 245.0 is the lowest recorded weekly weigh in I’ve had all year. My lowest weekly recorded weight since the beginning of 2014 occurred on April 10th of last year with a very manipulated weight of 244.2 – one week later (after my 12 week contest was over) I weighed 260 and strived to maintain that weight for the remainder of the year. If I maintain and weigh the same next Thursday, ie 245 then I’ll have an average weight for the month of 247. If I drop another 0.8 lbs or more then i can equal or better my lowest weight since I started recorded my weekly weigh ins – and that started 76 weeks ago. 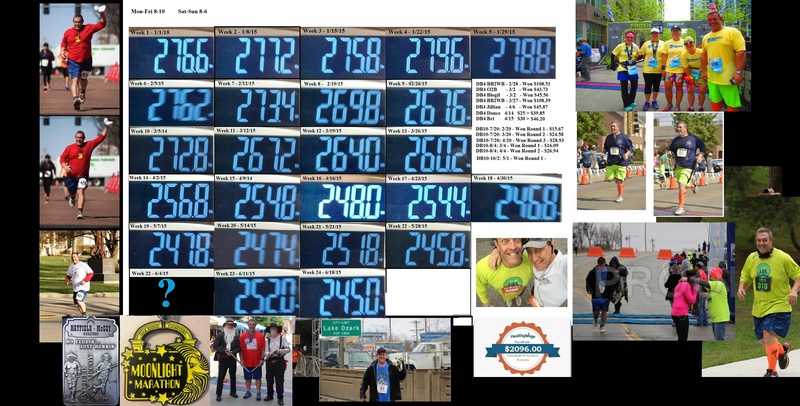 I think lower mileage runs could help a lot and mainly because they will be very low stress to my body relative to the nutty 26.2 miles done this past Saturday. I’m not exactly sure what my normal or relaxed weight is right now but I’m guessing it may be a bit less than 245. Kind of have to wait & see. I’ll have to hit a weight of 242 next week for an average of 246 (rounded). I added my two marathon medals to the lower left corner of my weigh-in wallpaper. That’s 2/3rds of the initiation needed to join the Marathon Maniacs club. 🙂 July 18th will be my third and final marathon needed to join the maniacs. On July 1st I have a Round 3 weigh-in for the most challenging of my 6 month, 10% weight loss challenges ….I’ll need to weigh in at 239.8 lbs or less. Mentally, I think I can benefit from some time in the gym. There is a decent chance of getting in 6 gym workouts during the remaining days of this month. I’ve been at zero for the preceding two months for gym attendance. Gym time and shorter runs may help a great deal with my mental recovery. I have two 5K runs and a single 1 mile run before June is over. For right now – i need to keep patient as well as keeping up some light pressure towards my goals. I should have greater clarity of vision in the next 2 weeks.